Email ID? 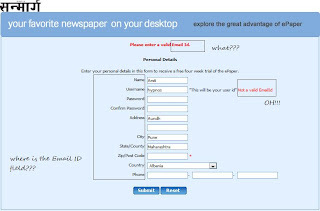 The form does not mention email ID anywhere, let alone ask for it. Oh, the error page tells him that the “Username” field should have been populated with his email ID. If you were that person, would you fill up that form again and continue to use the website? I didn’t. Who knows what other ‘mistake’ I would be chided for next? Is the phone number field actually supposed to contain my height? Is it so difficult for web designers and companies that hire them to make websites that are free of inconsistencies and are helpful instead of carrying the old ’80-90s attitude of “I made this thing and it works at my end. You need to learn how to make it work for you if you want to use it.”? It is all adding up to the user experience and thus the brand in the end.